Discover the Difference Service can Make! We offer a wide range of vinyl, aluminum and wooden residential windows. The quality of our product is 2nd to none and the foundation of our company is built on the highest level of customer service. We offer just about any type, style and size door for residential housing. Interior and exterior vinyl, wood and aluminum doors. We can also deliver custom doors. We can take care of all the measurements and installation. One of our specialties is the ability to provide any type of stock or custom solution to all your commercial needs. Besides windows we offer doors, siding and gutters for all you commercial projects. Columbus Window Co. also provides the best siding and gutter product and installation. We offer the widest selection of styles and material for bosth siding and gutters including no seam and Leaf Relief gutter solutions. Founded in 1984 with the promise of superior service to the construction industry, COLUMBUS WINDOW CO. has consistently strived to outperform its own high expectations. Combining high quality products with the most knowledgeable people in the industry, we go out of our way to make your job go smoothly. We offer job site delivery anywhere in Ohio, and we will even measure and install your commercial or residential job. We understand that quality is in the eye of the end user. With that in mind, we sell only those products that live up to our “VALUE TRIANGLE” concept. 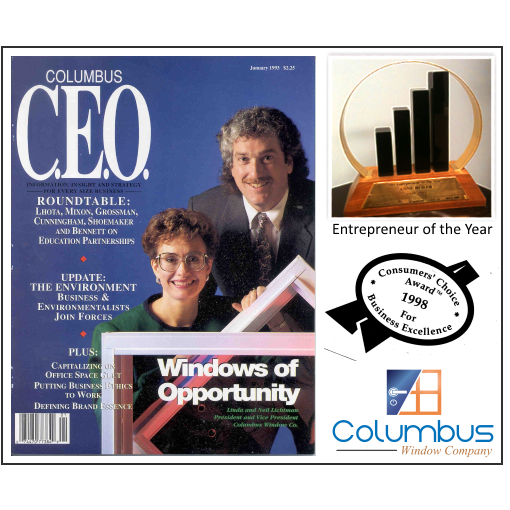 Even though Columbus Window Co. opened on November 29, 1984, the seed for its growth were planted several years prior. President, Neil Lichtman , was born in Akron, Ohio and graduated from Firestone High School as the class President. After running Tulane Travel for 3 years and working on several other activities, he graduated from Tulane University and went to work with Alside Supply Co. The F.A. Kohler Co. was the next stop before starting CWC. Wife, and co-founder Linda Lichtman was born in Tokyo, Japan and after several moves with the Air Force, her family settled in Fairborn, Ohio. After graduating from Fairborn-Baker High School and Wittenberg University, Linda started a career in computers. With Neil’s home improvement supply experience and Linda’s computer skills, Columbus Window Co. was founded on the principles of outstanding levels of customer service with consistent high quality materials. Despite a few setbacks with the banks, suppliers, and the SBA, Columbus Window Co. quickly became known as the place to go for windows, doors, siding and gutters.